Seems like everyone is now rallying to the cause ? Prisoners bought food from their canteen to send to foodbanks to help people on Universal Credit. At the Howard League for Penal Reform, we often visit prisons. When you are campaigning on prison-related issues it’s important to see as much as you can of life behind bars. Sometimes you learn something of life outside of prison too. I recently visited a prison and discovered that in the run-up to Christmas there had been a particular initiative suggested by prisoners and taken up by the staff. Prisoners had suggested donating to food banks in the community to help the unemployed and also those working but struggling with delays to benefits. The problems of Universal Credit are well documented, but it was startling to see them referred to in a prison. Not so long ago I sat in on a multi-agency meeting in another part of the country, looking at issues affecting children and families, and heard a succession of people from the local authority describing the difficulties faced by those starting work and awaiting support through Universal Credit. Waiting many weeks before benefits are paid is pushing some people into real hardship. Yet here were people arguably in worse straits, in prison, wanting to do something to help. The idea was taken up by the governor and both prisoners and staff purchased food items and donated them to the community. Most prisoners earn between £10 and £30 a week and this has to cover everything from basic treats like biscuits to toiletries, phone calls and stationery. A recent Freedom of Information response gives you an idea of what can be ordered from what’s called the prison ‘canteen’. Prisoners bought items from the canteen to be sent outside and staff also donated food as individuals. It was an impressive joint effort, a reminder that not only are prisons communities in themselves but that they remain part of our wider community. But some people might like to banish prisoners out of sight and out of mind. Yet it was also troubling to see some of the most vulnerable people in society trying to help others, however humble their efforts may have been. I’ve since been told of similar donations to food banks organised in other prisons. The prison system in England and Wales is currently facing a serious crisis of safety, with record levels of violence and self-injury. What does it say that people living and working in such a troubled system are trying to ameliorate social problems found outside of the prison gates? This is not simply about a particular government policy that is not working. Problems of food insecurity, of child poverty and the rising levels of homelessness will themselves contribute to crime if they are not checked. In turn, this will only increase the pressure on an already overcrowded and failing prison system. At the local meeting I mentioned earlier, there were concerns aired that issues developing in the community meant that children were both more likely to be victimised but also to fall into crime themselves. None of this will be solved by prisons. And if action isn’t taken then whole communities, both behind and beyond the bars, will suffer. It has been said over several generations that some of our senior citizens would be better off inside a prison. This initiative brings a whole new dimension ??? Even the Army are lending a hand ... and more ! Army to donate ration packs to feed poor families and homeless people across UK.
" This solution will deliver food products where they are needed while also minimising waste ", says MoD spokesman. Thousands of Army ration packs will be donated to charities to help feed poor families and the homeless across the country. Defence chiefs have announced that 20,000 unused ‘operational ration packs’ will be donated over the next few years. The Ministry of Defence (MoD) said the food will be handed to charity FareShare, which will then divide them up between charities across the UK including community groups, homeless hotels and lunch groups for the elderly. The ration packs contain enough to give 10 soldiers 4,000 calories to sustain them over a 24-hour period and include items for breakfast, lunch and dinner, such as porridge, sausages, baked beans, pasta and rice. Minister for defence people and veterans Tobias Ellwood said: “Ration packs help provide nutritionally-balanced meals to our armed forces on operations around the world. “But charity begins at home, and I’m pleased our partnership with FareShare will make sure no food goes to waste. The ration packs will help the recipient charities save on food bills, allowing them to re-invest money into essential support programmes. About two million ration packs are used by the military every year, with less than one per cent of the MoD’s stock requiring disposal. This scheme means when it becomes clear a batch of ration packs can’t be used, there is an opportunity to gift to those in need and ensure any good food does not go to waste. The operational ration pack provides a two-course breakfast, lunch and a three-course dinner, as well as a number of drinks, both hot and cold. Roger West, director of the MoD’s procurement organisation, said the move was “the right thing to do”. “I am delighted to be able to provide support for this important issue,” he said. Tens of thousands of people are turning to foodbanks for help each year. The Trussell Trust – a charity which co-ordinates a nationwide network of foodbanks – reported a 13 per cent increase in the distribution of three-day emergency packs last year. The Trust’s foodbank network distributed 1,332,952 three-day emergency food supplies to people in crisis between 1 April, 2017, and 31 March, 2018, 484,026 of which went to children. Two of the primary reasons people were referred to foodbanks was because of benefit delays and benefit changes. RAF air lifting supplies into foodbanks ? Royal Navy with fishing nets . providing fresh fish for the foodbanks ? Chesterfield Canal ... seeps through my manor , Worksop ... new assault training course for the SAS bringing in supplies ? Poor souls ... will need a fortnight being decontaminated !!! Thanks to Wendy at ChillForUs ... chill be the operative world ... pretty cold in " Nawfook." SAME PATTERN ... SEASIDE RESORT ... SEASONAL WORK ... AND NOW UNIVERSAL CREDIT ! School opens food bank to help pupils with no food at home. Foodbanks can apply for £100 worth of free stock per week...here's how. Starbargains.co.uk has launched an appeal which could offer foodbanks £100 to spend on supplies per week. The shop is the online arm of Yorkshire retailer, Fultons Foods. As part of their initiative, 10 foodbanks across the country will each receive a weekly budget of £100 to spend on the site, to allow them to fill inventory gaps and select the items they are short of, free of charge. Four UK foodbanks have already signed up to the scheme and StarBargains is on the lookout for six more. Karen Gunter, director at StarBargains.co.uk, said: “We are absolutely thrilled to be launching this project, and are really looking forward to making a difference to those in need alongside our foodbank partners. "As a food business it seemed appropriate to help those struggling with the cost of feeding themselves and their families, a worsening position nationwide. “By allowing these charities and support groups to order £100 a week from StarBargains, there’s a wide range of products they can select to ‘gap fill’, with which is significantly better than us deciding which products we donate. "So many generous individuals around the country are giving their time to these groups we are very pleased to be able to support them. For more information and to enquire about joining the scheme, foodbanks should contact cs@starbargains.co.uk. Who really cares if the foodbanks gain more supplies at a minimal cost ? Motive goes out the window if that choice of to eat / heat / keep a roof over one's head is made easier ??? Sunday morning ... time for my weekly trawl ... choice is increasing week on week ! The following article ... STRIGHT INTO THE TOP 3 OF ARTICLES EVER POSTED ON THIS THREAD ... read on !!! 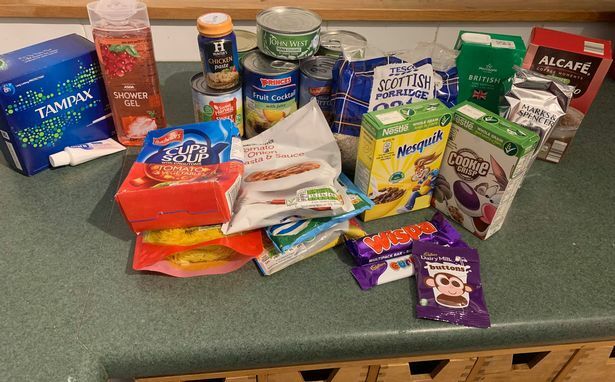 I lived off a food bank parcel for a week and here's what I experienced. Hull Live reporter Anna Riley experienced a service that many in Hull are forced to rely on. Feeling hungry is a nasty sensation. That awful burning in the pit of your stomach when you need to eat is horrible, and if you don't fill up fast, tummy cramps, grouchiness and dizziness can soon follow. But sadly for many people in Hull that rely on provisions from a food bank to survive, this is a feeling that they have to cope with on a weekly basis when there is not enough money for a food shop. In our region more and more families are turning to food banks to get by, with a shocking 5,000 emergency food supplies being handed out over the past year, making them a lifeline for many people. The number remains high in 2019 due to people struggling on low incomes, continued issues with benefit payments, issues with Universal Credit in the area and insecure work. In order to experience what it is like to rely purely on supplies from a food bank and to highlight the desperate situations some find themselves in, I got in touch with St John's Church in Bransholme, who help out those in need every week by handing out provisions donated by people in the area and from other local churches. The church help out anyone who comes in to ask for a parcel, and they often see people who work coming in to use the service, as well as those that are unemployed. Showing me what each food bank parcel would contain for five days, I decided to replicate it to highlight a growing issue in our society - and felt the pain of those who use the service on a regular basis. Upon arriving at St John's Church to hand in my food donation to more than cover the supplies I would be taking, I was struck by the friendly environment of the place. There were at least five families along with several individuals gathered together over tea, coffee and biscuits, chatting away and catching up before going back home with their supplies. It was a relaxing atmosphere with a real sense of community with a lot of laughing and joking, and there was certainly no judgement, which can sometimes be a stigma attached to the use of food banks. I spoke to a few of the families there, and they told me that without the donations given to them, they would starve, and that going hungry was tragically a common occurrence for them. Heartbreakingly, some parents said they often don't eat to ensure that their children can have a meal, as there is not enough food to go around the whole family. The food bank manager gave me a carrier bag before I left and told me that the provisions would last between four and five days, and that I should do my best to plan meals to work out how to best make the most of the food. He told me that the items I was given would be the same as they would hand out to any other single person like me. When I got home, I found that I had been given a range of tinned foods and packets of rice, pasta and soup, as well as tea and coffee, UHT milk, porridge oats, cereals, chocolate and a tube of toothpaste, tampons and shower gel. Looking at the items, I was a bit shocked at the small quantity of the provisions, as well as the lack of fresh food, and could tell straight away that I was going to find it a struggle. But I set to work in sorting what food would go well together, and what I should have for each meal. For my breakfasts I decided to make porridge with the UHT milk until it ran out, and then used water, and for my lunches I had soup. For my tea, I went for rice or pasta packets combined with food from some of the other tins including hot dogs, carrots and sweetcorn. I was grateful for the tea and coffee, as I do rely on a daily caffeine boost, and I was also impressed with the gift of toiletries including Tampax, as I know that period poverty is an issue in Hull, with hundreds of women struggling to afford sanitary products. Here is what I learnt over my five days of living purely off a food bank. I felt hungry all week and all I could think about was food, which was ironic, as I had hardly any of it to eat, and what was in my cupboards was not at all appealing or part of my usual diet. Porridge would fill me for most of the morning but then for lunch, I was making a sachet of the Cup a Soup I had been given, which was 89 calories per packet. One day I added a tin of sweetcorn for a bit of extra sustenance, but it didn't really hit the spot and lunch just mainly left me with stomach gripes, making it difficult to concentrate at work. There was nothing to look forward to eating when I got home, and the nice food that I had didn't last long. I ate the chocolate on the first day, as well as the tinned vegetable soup and combined the nicest rice (heat in the bag basmati) with tuna. The rest of the week was downhill, with packet rice and pasta with tinned carrots and cereal as a snack with tinned fruit and packet custard really not hitting the spot. Most nights I went to sleep hungry, or would go to bed early so as not to feel hungry any longer, which wasn't a nice experience at all, and in the morning I would then wake up starving. All of the food that I was to live off was not something that I would normally shop for. I was quite put off by the jar of chicken paste that I was given, as it looked like a strange type of baby food and smelt vile, but when you're hungry and relying on provisions, needs must and you can't turn your nose up or be fussy or else you starve. Eating food that comes purely from packets and tins without any fresh produce at all must be bad for you in the long run, as fruit and vegetables are essential for getting the right vitamins in to our bodies and warding off illness. Without them, you can develop nutrient deficiencies, which is bad for adults, and even worse for children. I normally try to eat fairly healthily, so I really missed fresh fruit and vegetables, yoghurt and cheese, and knew I wasn't doing myself any favours by eating packets of freeze dried food stuffed full of preservatives and E numbers, and hated the thought of not being able to access fresh produce if I was to constantly rely on a food bank. A New Year's resolution of mine was to exercise more from the start of January, which I have kept to, but going for a run whilst fuelled purely on provisions from a food bank was extremely tiring. I lacked energy to do a work out, but still pressed ahead, much to my detriment as I had then burned off more calories that I was unable to replace with a proper meal. I can imagine that people with manual jobs who use food banks would also struggle with strenuous work, and feel tired because of this. When I told my friends that I couldn't go out for tea, or mentioned to work colleagues that I was hungry, people felt sorry for me and offered me food, which I resisted. I appreciated their concern, but I can imagine for people using a food bank that such comments could appear a bit patronising at times, and that pride could make people feel a little stung and not as worthy as others, just because they can't afford to eat. Saying that, I was quite jealous of other people's meals, seeing food on adverts, and any mention or discussion of food, but tried not to dwell on it. As ungrateful and privileged as it sounds, I really missed being able to have a drink at the weekend, which I obviously couldn't do on food bank provisions. The pub was off-limits, as well as a cheeky glass of wine or two at home, and it made me think of how I take such a simple thing as having a tipple for granted. The food that I was given relied on me having a microwave and oven hob to cook with, as well as a tin opener and access to hot water. I know it may seem basic, but if homeless people were to use a food bank service, as many do, it made me think that they sadly may struggle to make many meals with packet and tinned food. On a similar note, I luckily don't have any allergies or food intolerances and I'm not vegetarian, but using the food bank also made realise that it would have been even more difficult if I was unable to eat a particular kind of food, as the options I was given were already limited and I may have been restricted even more if this was the case, which may be a reality for others using the service. Overall, for all the examples I've given, living off a food bank is certainly not something I would want to do again, and it made me appreciate just how lucky I am in being able to shop for what I fancy in the supermarket, as well as my ability to go out for a meal, order a takeaway or have a drink should I wish. I lost weight during the experience, which I could have done to anyway after too much festive overindulgence, but it wasn't a good way to go about it, and it would definitely be detrimental to those already at a healthy size or underweight. Thankfully, I only used the service for less than a week, and couldn't imagine having to be on provisions for any longer. It definitely opened my eyes to the harsh reality that many people in our region have to face when they don't have the funds to feed themselves or their family, and broke my heart to think what people would have to go through without a food bank. The stark truth is that without food banks people go hungry, and food banks prevent people from turning to extreme measures such as shoplifting or rummaging through bins in order to eat. Such voluntary services are vastly becoming more than just an emergency hub for food supplies for hungry families. They also look to support people by offering help with information on welfare, housing, job skills and grants and often refer people to other agencies and charities, and at the moment, they are a much needed community asset. What should you give to a food bank ? Food banks take a wide range of food items and a typical parcel will include cereal, soup, pasta, rice, pasta sauce, beans, tinned meat, tinned veg, tea and coffee, tinned fruit and biscuits. On top of that they also take in a variety of non-food items, such as toiletries and hygiene products, including toiletries and household items such as laundry liquid detergent, laundry powder and washing up liquid. Feminine products such as sanitary towels and tampons, and baby supplies including nappies, baby wipes and baby food, are also accepted. As well as willingly taking any donations, St John's Church food bank is open for anyone in the Bransholme and surrounding areas to use, and the drop in is every Tuesday from 10am. Hull Foodbank is also another service that people in need can access, and they are based on King Edward Street. The social war enters a new phase ??? Universal credit : DWP " Bans jobcentres from referring people to food banks. " Benefit claimants " Slipping through the net " after claim government is ordering local jobcentres to stop referring them to food banks in a " Ploy to hide those needing help. " Jobcentre staff have been ordered not to refer universal credit claimants to food banks, in a move campaigners have said is preventing vulnerable people from getting vital help and “hiding” those who are in need. Food bank volunteers in Lewes in East Sussex have told The Independent people in need of support were “slipping through the net” after the Department for Work and Pensions (DWP) issued the local jobcentre with a national directive stating they were no longer able to refer people. A leaked email from staff at Lewes Jobcentre, published on neighbourhood watch site Lewes Eye, said the DWP policy “does not permit” foodbank referrals and that the local jobcentre had been advised to “verbally signpost” people to charities who can formally refer them instead. But volunteers said many who needed support would not approach charities because of the additional stress and the embarrassment of asking for help for a second time. More than 1,000 people in Lewes have been moved on to universal credit, the government’s flagship welfare benefit, despite warnings the new scheme is driving people with disabilities and others with vulnerabilities into severe hardship and causing anxiety. Debbie Twitchen, from Landport Foodbank in Lewes, said she was “very unhappy” about the alleged policy because the food bank requires a written referral for anyone receiving a food parcel. She said she believed it was a way for the DWP to “hide that people are going hungry and needing food banks” due to “failures in the system”, and added: “I know that it’s an obvious ploy – if you can’t show figures for something then it’s not happening is it? Ms Twitchen said she was concerned that people wouldn’t want to put themselves in the “humiliating” situation of getting referred to a different agency. “I fear that people are going to be slipping through the net because of it,” she said. “People can’t just walk in [to the food bank] – we absolutely require people to have a referral. I don’t see what the sense is in people saying we’re not going to give you a referral. [The jobcentre] people are best placed to make one because they know the financial circumstances,” she said. A second leaked email from a food bank in Eastbourne, also in East Sussex, suggests that more than one jobcentre is following the no-referral advice, although it’s not clear how widespread the issue is. In one of the emails, the jobcentre worker wrote: “While we at Lewes Jobcentre have been adopting a locally agreed process, we have been advised that DWP policy does not permit Jobcentres to refer customers to foodbanks by issuing vouchers or referral forms. A DWP spokesperson said their policy on food bank referrals had not changed. “Jobcentres will signpost people to food banks and other services according to their individual circumstances, as part of their support to help people manage their finances and get into work,” the spokesperson added. Also reported in The SUN ... and , a COMMENTS section ... enjoy ! Amber Rudd links universal credit to rise in food bank use. Amber Rudd says the increased use of food banks is partly down to problems in rolling out universal credit. The work and pensions secretary said she was "absolutely clear there were challenges with the initial roll-out" of the benefit and that the difficulty in accessing money was "one of the causes" of the rise. But she said the government had made changes to help tackle food insecurity. Universal credit has been plagued with problems since its inception in 2010. The monthly payment merges six different benefits for working age people into one and has been subject to a gradual roll-out across the UK. The system was supposed to be up and running by April 2017, but it has faced numerous delays and is now not expected to be fully operational until December 2023. Research released by the Trussell Trust charity this month showed the use of food banks had increased by 52% in areas where universal credit had been in place for a year or more - compared with 13% in areas where it had not been. Speaking in the Commons, Ms Rudd said the government was "committed to a strong safety net where people need it". "It is absolutely clear that there were challenges with the initial roll-out of universal credit," she added. "The main issue which led to an increase in food bank use could have been the fact that people had difficulty accessing their money early enough. "We have made changes to accessing universal credit so that people can have advances, so that there is a legacy run-on after two weeks of housing benefit, and we believe that will help with food and security." Pushed again on the cause of the issue by Labour's Stephen Timms, Ms Rudd added: "I have acknowledged that people having difficulty accessing the money on time as one of the causes of the growth in food banks, but we have tried to address that." The Department for Work and Pensions has said that, under universal credit, people are moving into work faster and staying in work longer. According to the Resolution Foundation think tank, 2.2 million families are expected to gain under the system, with an average increase in income of £41 a week. However, 3.2 million families are also expected to be worse off, with an average loss of £48 a week. Labour has called for ministers to halt the roll-out "as a matter of urgency". Boro fans urged to support foodbank with donations. MIDDLESBROUGH Supporters Forum (MSF) is asking generous Boro fans to support it latest initiative and take a foodbank donation to the home game against QPR on Saturday, February 23. Urgently needed items required include: tinned ham, instant mash, sponge pudding, meatballs and custard. Shades of our " Carers Letter " back in 2009 ? People are sharing this open letter to MPs from a food bank volunteer about the struggles of people who rely on it. Joanna Young penned an emotional letter outlining people's struggles in her area. MPs Frank Field and Heidi Allen visited Ms Young's local food bank this month. Her subsequent letter has been shared thousands of times . A food bank volunteer has written to MPs Frank Field and Heidi Allen after the politicians attended her local branch to talk about the devastating impact of cuts to social care. Joanna Young, the chair of trustees at Morecambe Bay food bank, a Trussell Trust centre hosted at St Barnabas Church, was disappointed to miss the MPs when they visited last Tuesday. Mr Field, now an independent MP but formerly Labour, and Ms Allen, a Conservative, are spending time touring the country to visit and talk to some of the country’s more vulnerable and deprived people. In their respective roles as chair and member of the Commons Work and Pensions Committee, Mr Field and Ms Allen are investigating deprivation in London, Newcastle, Leicester, Morecombe, and elsewhere. Government cuts have plunged millions of people into poverty. Ms Young shared with i the letter she sent to the MPs. She said she was inspired to do so after serving seven separate women, all with young children, each of whom had no food or heating. “It is utterly avoidable,” Ms Young said. Ms Young, who works at a design agency in Lancaster, said she has spent the last two years “composing carefully constructed press releases” that “avoid controversy”. In those two years, Ms Young has seen dependency on the food bank skyrocket. And the numbers of users have continued to climb. In her letter, she said the much maligned Universal Credit welfare system is to blame. Now, following Mr Field and Ms Allen’s visit to Morecombe, Ms Young said it’s time to share what she really thinks. She stressed that the letter, which she also posted to Facebook, contains her views, and not those of the food bank or Trussell Trust. My name is Joanna Young and I am Chair of Trustees at Morecambe Bay Foodbank. I am sorry not to be with you today but I am at work so I thought I’d write to you instead. I have spent the last two years composing carefully constructed press releases that stick to the line, avoid controversy and don’t get too heated. But now it’s time for me to tell you what I really think, especially as you have come to listen, so here goes. These are my views, not those of the Foodbank. The numbers of people without enough to eat in Morecambe continue to go up, and this is directly and absolutely caused by the deliberately hostile welfare policies that have been introduced since the roll out of Universal Credit. This includes the current rate of benefits, zero hours contracts and the changes to, and caps on, disability and other benefits over the past five years. Last year (January – December 2018) at Morecambe Bay Foodbank we distributed over 7,000 emergency three day food supplies. The population of Morecambe, where the majority of our clients live, is around 40,000 people. I have met mothers with children the same age as my own, who have had to ask me for a toothbrush for their child; women who regard sanitary towels as a luxury; and mums for whom deodorant or shampoo for their partner or teenage son is a treat. That’s degrading, but it’s nothing compared to what it’s like to be given food that you didn’t choose and aren’t sure what to do with, with which to feed your children. I have met dignified gents my Dad’s age who have been ground down by a system that has refused to recognise their talents, their potential or their experience and that treats them like failed economic units of production when things go wrong. Even when they’ve paid their taxes, sometimes for forty years or more. All they want is a bit of help and instead they get a kick in the teeth and they can’t believe they’ve ended up in a Foodbank. I met a magnificent lady who drew herself up to her full height and eloquently described her professional life before she got sick, and her anger when she got judged to be well enough to work. She paid into the system all her working life and then got nothing back when she needed help. She packed her tins of donated food neatly away, straightened her back and went away, her head rightly held high. She should not have been in our Foodbank because the state should have been helping her when she was too sick to work. I meet ex-cons who are released from prison having been ‘rehabilitated’ by doing nothing inside, who are given forty six quid and told to go away, with no phone, no idea how to use the internet, no skills and no home, and who are expected somehow to contribute to society shortly thereafter. I have met pregnant women who have not eaten for a while, and who need money for nappies, because the baby is about to arrive. I have met people who were sanctioned because they were having chemotherapy and missed a DWP meeting. I met one man who walked from Carnforth, eight miles away, in the rain to get to our Foodbank because had no other means by which to feed his family. I have met people who are so ashamed and upset that they won’t meet my eye, and I don’t blame them a bit. Some people come in and cry when you offer them a cup of tea or a biscuit because no one has been nice to them for a long time. Now, I am starting to meet people who think that it’s normal to be in a Foodbank. Those are the ones that I find the hardest to serve. This is not normal. We have a welfare system that regards those who ask for help with suspicion and derision. A culture that assumes that if you’re not earning, you have no value, and if you ask for assistance then you are weak, helpless, lazy or stupid and that it is definitely your fault. We have a system that is so mind bogglingly expensive I can’t even start to imagine the cost. The cost of a cohort of children who have been raised to think that it’s normal to attend a foodbank. Kids who have to sellotape their shoes together, have no coat in winter – in Morecambe – and get in trouble for it at secondary school. A generation of people who are growing up in a culture that doesn’t treat them with potential, excitement, creativity and encouragement but that punishes, demeans, demands and then blames them for their own miserable shortcomings when they can’t magically summon up the social capital to succeed. The price of this in mental health, low educational attainment and expectations, poor physical health and lack of aspiration is astronomical. How can you expect people to pull themselves up by their bootstraps if you take away the boots and the straps? How can a single mum even think about an education course or a different career when she can’t feed her child? How can a growing thirteen year old boy concentrate on his homework if he’s hungry and doesn’t want to upset his mum by asking for something to eat? How can you expect people to plan and take responsibility for their finances when zero hours contracts treat them as dispensable economic units rather than people with rent to pay, homes to heat and children to care for? That’s not socialist talk, that’s just real life. The haves and have nots are now divided by a wafer thin bit of paper – between those who are just about making it, and those who by sheer bad luck, bad judgement or both, are not. When you don’t make it, the ladder is kicked out from under you and you fall to the bottom, and sometimes you just can’t get back up, however hard you try. Our donations from the general public, our Facebook comments and our surge in volunteer numbers are showing that people now understand this. I would suggest that electorally speaking, it’s an unwise course. From a conservative point of view, not investing enough money into these communities is fiscal madness. You are piling up years of economic sluggishness and depression into the future. Where will the bright lights of economic growth, entrepreneurialism and nurtured talent come from if you treat people like this? Children in this kind of poverty can’t aspire – they are too hungry! Ask the amazing teachers that you will meet today whose jobs have morphed from being educators to being triage on the front line of a need that isn’t letting up and has no end in sight. They are unlikely to attain Mr Gove’s exacting grammatical standards in key stage 2, not because they aren’t trying but because Maslow’s hierarchy of needs is so obviously getting in the way. So, to paraphrase Bob Geldof, who confronted a very different kind of hunger but who had the same kind of indignation that I (a devoted political centrist and usually reasonable human being), feel about the current situation in England: please, just give them some ******* money. This is so utterly avoidable, so pointless and so costly. If you leave people with no money in a situation whereby they have nothing to survive on for five or more weeks, that there will be a major crisis in their lives and the lives of the people who depend upon them. Isn’t that obvious? How would you cope if that happened to you? I couldn’t walk a day in the shoes of our clients and I challenge any politician to try it. As I hope you will know, The International Covenant on Economic, Social and Cultural Rights, signed and ratified by the UK and effective since 1976, regards access to adequate food (as well as social security) as a human right. The state is currently, according to our evidence here in Morecambe, in contravention of this to the tune of the 1,229 families with children in them that we helped last year. You must do something about this, if you can. A word on our sixty magnificent volunteers who give their own precious time to help people they don’t know every week. They are the demonstration of all that is right in our society. They show kindness, determination, love, great character and huge compassion. All of these things have been lost in the culture of our welfare state and I heartily hope that this will change in the future. Since when did we think it’s normal to punish people who ask for help? Thank you for coming to listen to us today, thank you for being willing to hear what we have to say and I hope that it has been useful to you. If you have any questions of us please just ask. We are committed to doing anything that we can to change this situation and to make our welfare state more kind and more compassionate for those who are already at the bottom of the social pile. A final thought. After a busy listening session at the Foodbank I go through a small but important ritual. I pick my kids up from school, sometimes letting them have whatever snack they want from the corner shop on the way home. Getting home, I turn up the heating to dangerously luxurious levels, let the children relax and do what they want, put on my slippers, make a cup of tea and then I sit on my bed for a few minutes on a soft wool blanket that was given to us for our wedding, and I just have a moment to myself. I am so, so lucky. These simple pleasures – a snack, some free time for the kids to play with their toys, a cuppa, a warm, comfortable house, a soft clean blanket – these are, for many of our clients, things they don’t have. In 2019, in England, it seems that I am rich indeed. Move over Hislop , there's a new kid in town ! Bubble ... Heidi Allen to Frank Field ... " Not even a complimentary tin of caviar. Are they all like this ? " Use of food banks in York soars by more than a quarter. The use of food banks in York surged by more than 25 per cent last year, a landmark report has revealed. The York human rights indicator report says that a ‘significant proportion’ of referrals to the city's food banks related to benefit problems. The news comes after work and pensions secretary Amber Rudd admitted earlier this week that there was a link between the national increased use of food banks and problems in rolling out Universal Credit. She said there were challenges with the initial roll-out of the benefit and the difficulty in accessing money was one of the causes of the rise in food bank use, but said the Government had made changes to help tackle food insecurity. The York report said that according to The Trussell Trust, which runs food banks, referrals in York went up by more than a quarter in 2018 - "with a significant proportion of referrals relating to benefit changes, delays or sanctions". It says: "Although this tells us that food poverty and insecurity are increasing, it doesn’t give the true scale of the problem. These figures don’t include independent foodbank projects in the city (e.g. through community centres), and there is no comprehensive data on numbers of people using free or pay-as-you-feel meals. "The Independent Food Aid Network estimates that the Trussell Trust accounts for around half of the nation’s foodbank use, and the York Food Poverty Alliance is working on other ways to measure food poverty in the city." The report, produced by the York: Human Rights City network, also says that the earnings gap - which measures the difference in weekly wages between those earning median (mid-point) wages and those on low wages - rose slightly last year, because earnings grew more at the median level than for lower wages. It said York’s mid-point earnings continued to be lower than the UK mid-point earnings, but higher than those in surrounding areas. It said housing costs pushed families with children into poverty but even so, more than one in 10 of York’s children lived in poverty before housing costs were considered.